Who doesn't love a serving of possibly one of the simplest, creamiest, heaviest, heartiest, but utterly delicious pasta dishes? Well if you say you don't like it, you're probably lying to yourself or you aren't human. There really isn't much that needs to be said about this other than the fact that I highly recommend using double or heavy cream instead of single cream for the pasta. It results in a thicker sauce, but one which just makes you want to cuddle up in bed with a teddy bear and a huge smile (in other words, its yummy to the Y). It makes for a great side or a mains, and goes well with sauteed garlic shrimp or chicken breast, or just some steamed veggies like broccoli or asparagus (perhaps with a hint of a balsamic reduction sauce?). Apologies for the crappiness of the photo--only had a phone camera at hand at the time. 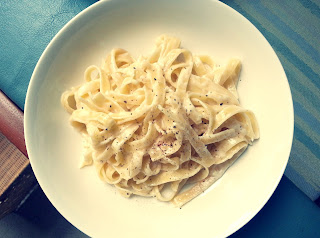 Cook fettuccine in a large pot of unsalted water. In another pan over low heat, melt the butter. Add in the cream as the butter melts. Stir continuously to combine the two. Do not turn off the heat! When the pasta is cooked (al dente, preferably), lift it out with tongs and transfer it right into the cream sauce while it's dripping wet. Increase the heat to medium and swirl the pasta around in the sauce until it's all combined. Add half of the cheese and keep swirling the pasta until it's coated with the cheese. If needed, add a couple of tablespoons of pasta water to thin the sauce. Add the rest of the cheese and repeat this step. Serve immediately with a dash of black pepper and nutmeg sprinkled on top, and with some grilled or steamed veggies on the side. Sauteed and grilled meats work well too!